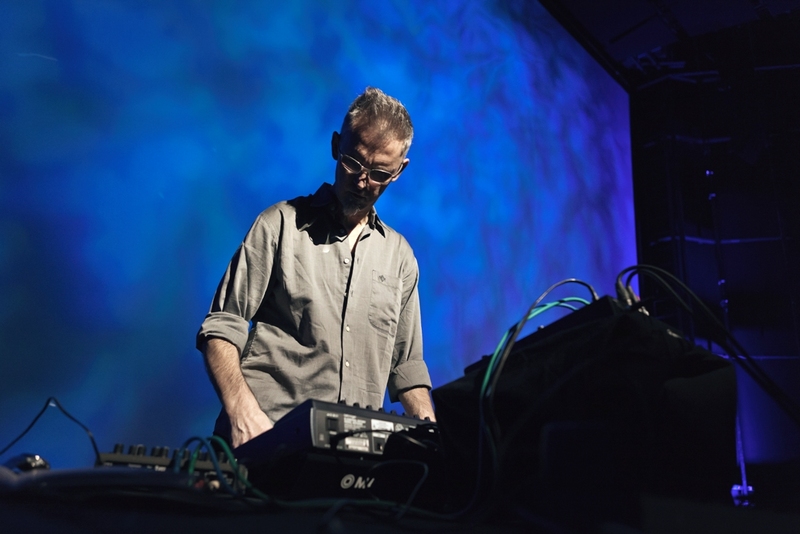 Ame Zek is an electronic musician, sound artist, and composer based in Berlin, a producer of sound waves and LFO modulators. The music of Ame Zek is constructed from modulation chains to create a platform for building evolving sound structures. The result is an evolution of sound structures through modulation, where ever-changing patterns shift in time with common dependencies and an autonomous movement. This intricate structure is it’s own character, it is what becomes his music. Ceaselessly focused on the intricacies of oscillating sound, Ame Zek employs an active combination of senses in touch, sight, and listening. This interview was done in a backyard of one of Berlin’s blocks, our conversation intercepted by random sonic occurrences, the beautiful contingent nature of sound of the environment. Ame Zek was nominated for SHAPE by the CTM Festival. In your work, you use modulation and synthesis, the sound of the machines, but are you also inspired by the sound of the environment? Ame Zek: I don’t directly use any sound from field recordings or environments, but I like to listen, the squeaky sound of the train being one of my favourites. I’d like to play a live act with this. Last year, at Fette de la Musik, I wanted to play outside following the train sound, but it was raining, so it was cancelled. What aspect of sound fascinates you? AZ: Being in the music, in the sound is a pure spiritual experience for me. Being here now, in this listening environment and talking to you, is also kind of spiritual. Could you explain this spirituality behind it? AZ: I started playing music very early. My first direct experience with it happened at a moment when I touched the acoustic guitar, playing it on a bed in a small room as a child. It was a magical moment. That was the biggest discovery of my life. AZ: That was epiphany number 1. AZ: Of course. Epiphany number two happened when I was in Amsterdam in a squat with friends of mine living there. I saw an Atari computer for first time in my life and realised that this is what I was going to do. So I started making electronic music straight away. So it was the machine that made you think of making music? AZ: No. At first I played classical and then later electric guitar for years. Electronic music was an extension of thinking about music, a completely opposite way to thinking about acoustic in the sense of timbre and the process of making it. At that moment I was fed up with the human factor in bands. That was a salvation for me when I realised I can do complex music even if there are no people and I’m going to do it with electronic instruments. How do you work with electronic instruments, let’s say as opposed to acoustic ones, in terms of the process of music-making, the thinking in terms of the content. AZ: The great possibility in electronic music is that you can have a constant modulation of sound. This you can also do with acoustic instruments but not in exactly in the same way. Anyway, the result is always different, acoustic sound is acoustic, electronic sound is electronic, but in certain sense they are almost identical. I think one of the most important premises of being a musician is that you have your own articulated language or your own sound and you have to work years to reach it. If you want to be a guitar player or a piano player, you have to have the same pattern, you have to work for a long time just to produce your own sound, to articulate your own timbre in your own soul and then you can go further. It’s probably even harder to do real individual sound in electronic music because you have to adapt the electronic instrument to your senses as a human. You have to find a way how to work with it means you have to define the strategies and limitations! It is an ongoing process, a kind of translation, a double trouble situation. I spent twenty years more or less working with the same machines just to get to control my electronic environment on an intuitive level of a human being. Lot of musicians have a favourite instrument with which they can best articulate what they want. Other musicians buy new and new gear, and then the sound amplifies or changes according to the gear, which makes it dependent on that. For you, what is the relationship with the machines that you have? AZ: We make choices dependent on how we respond to something. The first time I heard the sound of the Clavia Nord Modular synthesizer, it touched me. This also demonstrates my sensibility, because I think any choice is based on that. It’s your own sensibility that creates your choice. With machines, there is a certain contingency, giving the machine a leeway to come up with the unexpected. AZ: Of course. Random processes, random generated music, permutations… If a musician comes to a point where he can leave behind the technical side of making music, and also the knowledge, and fall into the relation with what is happening to the music, then the degree of randomisation or space modulations and the whole content of that is more or less on the same level of treatment. Is your music mostly improvised? AZ: I used to play improv regularly almost every week for a few years. One day I decided to stop it in search of the “final form”. I’m not really improvising, but I’m using modulation groups to compose the modulation structure that is not free of random possibilities or moments, but it’s not really improvised and recorded. It’s just a working of modulation chains in the structure. Why did you decide to move on from improvisation? Because you wanted to have more control over what’s going to happen? AZ: This is also the need to have certain order in the work process. It’s a kind of enjoyment to build models in new phases, new topics. The theme could be filters, space, atonal music, drones. Improvise on a certain level, and then turn and take it as a model and make it into a process that has a beginning and an end. This beginning and end, the finiteness, is your preferred modus operandi? AZ: No, it’s just a wish. It’s just a premise to keep it as a reference. In fact, everything happens completely differently. When you realise that you are struggling to have a structure that should be clear and regulated, and somehow it always turns out to become something else… you are not ‘succeeding‘. So you are accepting another kind of dynamic and going into a different direction. I’m trying to put an order into my mind, give myself a chance for perspectives that I would not have doing only improvisation. You said you are trying to have a beginning and an end. How do you then see the development in your work or where would you like to go with it in terms of the whole body of work. AZ: At the moment I have a strict interest and one of them is the expression of pure energy. I hope my music can achieve this, this really pure state of energy, a kind of poetry. Something that eclipses description or language. You come from the Dalmatian coast of Croatia. Were you inspired by the environment and the music coming from there? AZ: Everybody is conditioned by the environment where they grew up, me included. Seaside, sunshine, waves and wind, different acoustics and different folk music excerpts which touched me – I take all of this with me, it’s the base. How would you say that this influence manifests in your music? AZ: When I grew up, people would be playing rock’n’roll, jazzy stuff, evergreens, which never affected me personally. I was always trying to play broken rhythmics, the basis of which comes from Macedonia. It’s a folk, dance music rhythm called Teshkoto and it is part of the authentic aksak rhythm 5/13 (5 hits over 13 beats) and other similar unpaid time signature like 7/8 from Kosovo. When I heard it as a boy, I already felt how interesting it was, because it was irregular. As a child I heard folk music from Istria, a UNICEF-protected form of music, because it has its own scale and moments of improvisation in it, on the radio. It’s music based on two voices, flutes and vocal improvisations, which is really rare. When I first realised it as an adult, that it is part of my influence, I laughed because it’s really part of who I am. My grandfather was a dance teacher and my mother was a really good dancer. Influences of the environment are really stronger than we believe. Even if I heard it just for five minutes, the rhythmic of Macedonia remained in my head forever. Because afterwards, when you are confronted with the first music which is located outside of standards, such as the jazz form of John Coltrane, the guitar playing of Jimi Hendrix, contemporary music of Xenakis or Ligeti, simply music that is not based on clichés, that was what was has always touched me. So you like things that are somehow different and deviate from the norm. AZ: Yes, I think I respond to them. I’m a client of irregularities.